Quilts > ANTIQUE QUILTS > AFRICAN AMERICAN SUITING SIGNATURES TITHING ANTIQUE QUILT Dial family AL. Quite small and narrow strips of wool suiting are each signed with the names of members of a Southern Baptist church group. Among the hundred-plus names embroidered in white thread in tiny block letters, instread of the usual cursive, are some members of a Dial Family. Research is underway to see if they are related to folk artist Thornton Dial of Alabama, whose sister Lucille worked in a textile factory. 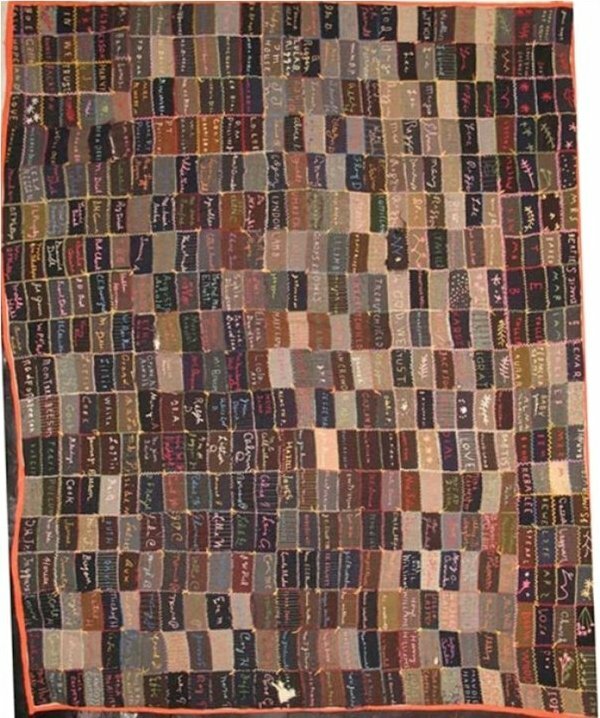 This quilt is currently has just returned from being exhibited at the American Embassy in Dakar, Senegal as part of the United States government's ARTS IN EMBASSIES PROGRAM which just celebrated its fiftieth anniversary.